Usually a diary is filled with secrets, not this one this one is filled with much more than that. Diary Of a Part-Time Indian is funny, fun, emotional and sad. All of these feelings bundled up inside of this kid that lives on an Indian reservation. His name is Arnold Spirit he’s a goofy nerd who’s only friend is Rowdy, an over tempered and abused teenager who won’t let anybody stand in his way. Arnold soon learns that there is more than living on an Indian reservation and decides to leave. I don’t want to ruin anymore to this amazing book. So if you want to know what happens to Arnold and Rowdy you are going to have to pick up this great book and begin reading it! 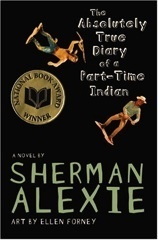 The WHS library owns The Absolutely True Diary of a Part-Time Indian.